This setting makes the number of days you define for the allowed password age apply immediately for all existing passwords. This setting lets you specify in how many days existing passwords will no longer be valid. 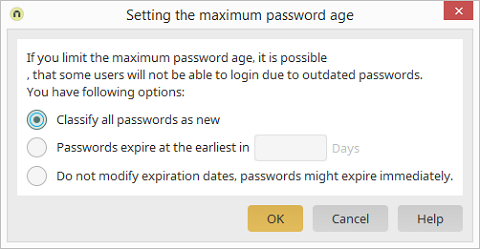 This setting is based on the actual age of existing passwords that will immediately lose their validity if you have reduced the allowed password age or have set it for the first time. Please note that some users may no longer be able to log in to the portal if you do not choose appropriate settings for them.